One of our long time regular readers Doodle has kindly agreed to help out here at 365 by writing a blog post for me every other Wednesday. Today is her first regular post although not the first she has contributed. She has become quite the expert on the subject of decluttering over the years and I am sure you will all be able to learn a lot from her. Welcome Doodle and thank you for your contributions, past, present and future. The biggest reason I owned too much stuff, was I just never realised I didn’t have to. It was as simple as that: getting rid of stuff as a regular proactive life choice had just never occurred to me. Knowing you don’t have to keep everything you’ve ever owned is a life skill in my opinion. Some of us learn this sooner and some of us later and like all life skills, the fact it is ok to let go of stuff can be taught and learned. We don’t have to be trapped for ever in being overwhelmed by excessive belongs…how good is that! So those of you who have been de-cluttering for a while now, do you realise you are honing an excellent life skill that you are not only benefitting from yourself, but can pass on to others? After all I have learned about de-cluttering in the last 3 years I found myself naturally helping a few family and friends who’d got a bit overwhelmed. It became apparent that I have a knack of helping in just the right way and they all encouraged me to do it professionally. So now I do. I love it so much. If someone came to you for help, what 3 top tips would you give them to get them started and how would you sell the knock on benefits of a de-cluttered life to others in less than three sentences? Declutter something hanging on your wall. Take the stairs instead of the lift. The exercise is good for you and you save electricity. I have to remember this myself instead of walking past the stairs, that are right outside my apartment door all the way across the building to the life. I may actually hardly be using any extra energy by taking the stairs. Silly me. 1. Do it slow – Whenever I said I was going to declutter my space in a day I usually got rid of nothing because I felt so overwhelmed and pressured into getting rid of things I wasn’t ready for. Doing it slowly takes away that pressure and makes you more open to decluttering items you wouldn’t otherwise. It gives you a feeling of choice. 2. Don’t add to the pile – If you’re already overwhelmed by what you have, don’t bring in more. If need be remove sources of temptation, instead of shopping go the movies or work out, unsubscribe from email newsletters and catalogs, if you shop on a break at work find a new and better way to enjoy your time ie. a walk in a nearby park, reading, or any other short relaxing activity. 3. Make a list of your priorities – Wife/husband, children, friends, perhaps add hobbies or interests or life goals you would like to work on. Start trying to center your life around those priorities and remove anything which detracts from them – whether that’s sacrificing those 2 hours you spend watching TV a day, or switching off your mobile at dinner, giving up facebook so you can spend time with those people, or have time to pick up the phone a little more often. In short, figure out what you can declutter from your life in terms of not just objects, but how you spend your time and start using that time to spend time on your real priorities. It’s so easy to plod along in life and do the same things we always have without thinking about the long-term. I constantly ask myself if in 10 years time, if I was looking back over how I am living now, would I be happy with how I spent my time? How do I think I could have spent my time differently? And then I implement it. Fabulous Jane, thanks. All really valid. And I love how you’ve included de-cluttering how you spend your time too. I found the challenge of de-cluttering old hobby stuff naturally led on to what I do with my time. It took a year or two, but I gradually let go of old unfinished projects. I am now super careful of taking on any new creative hobby (which normally involves buying loads of delicious looking stuff). Hi Jane, you answered these question pretty much the same as I would. All great tips and reasons. Funnily (?) noone ever came to me for help in that area. That said, I’m really happy to have become better at that life skill. Like you I just always assumed you “had to” keep things. Not any more. I think the things to say about how and why to declutter are different from one person to the other. People who are trying to get rid of clutter are so different both in the state of their order kept at home and their emotions towards stuff. However, the most important tips for me have probably been (and still are!) to go in small steps, to declutter regularly and go through the same area again and again and to not get discouraged but remember that every thing less is a thing less after all, no matter how tiny or insignificant it was in the first place. The most important practical tips were probably getting to know the different options and places to get rid of stuff and setting up a “donation bag” in the apartment. Also, to stop shopping!!!! You are so right about everyone being different in their reason/approach to de-cluttering Sanna. Everyone of my clients are completely different: some I can work very fast with and others I need to go much slower, at a pace their emotions can cope with. It is so important to respect them as individuals. I agree with you too that being an example to others in your life is the only way to do it. Those friends/family who came to me for help were enthused by my talking about what I was up to for myself because I think they wanted some of that for themselves but didn’t know how to start. We all have to be ready for change don’t we to be able to implement it. The thing I find hardest about de-cluttering my own stuff – is getting it out the door, so your point about knowing where things can go is very pertinent. 1. Get rid of clothes that don’t fit and shoes that you never wear because they pinch or rub. 2. If you have several of the same kitchen items (eg corkscrews. bottle openers, can openers) cut it down. 3. Go through your bookshelf and get rid of any books that you can’t honestly see yourself reading again. 1. You can see what clothing/shoes you actually have available to wear. 3. You can see the books you still have to enjoy. Yup, love it. They seem so obvious the points you have made, but it’s amazing how many of us have stuff our eyes just seem to glaze over and not ‘see’. And yet de-cluttering doesn’t have to be getting rid of loads – half a dozen items from your wardrobe/bookshelf/kitchen drawer can make such a difference. (And in my experience, lead you to getting rid of half a dozen more once you experience the benefits of just small changes. 1. Start somewhere, not matter how small or insignificant it may be. Don’t let perfection paralyze you into doing nothing! 2. Before you start though, identify what makes you angry, sad, disappointed, stressed, or aggravated about an area. Attack that area first and deal with what you have been avoiding. 3. Don’t stop. Even at one item a day, your further than if you did nothing. 4. Read blogs (or books, if you prefer) that encourage the type of life or behavior you strive to have. Just because you don’t see it (when you start decluttering) doesn’t mean you can’t obtain it. It takes time. I would have never gotten anywhere it I hadn’t come across blogs with people struggling like myself to get where they wanted in their homes. 5. Allow yourself the power to make solid decisions and actually get rid of items – even if it means straight tossing it in the garbage. Even if it means someone may be disappointed with your decision. Even if someone comes back later and asks about it/for it. Make a choice, and follow through and don’t back down from it. I think many people won’t start because you have to own the responsibility of making decisions and taking control – and possibly going against the grain. More great ideas from a different perspective Michaela. It just show many heads are better than one when it comes to brain storming ideas/solutions. I have found with clients, introducing the wide variety of emotions than might be behind each different horded item has been a real eye opener for them and been the key to being able to let things go. Having experienced the paralysis of dithering myself, I definitely agree with the ‘make solid decisions and actually get rid of items’. 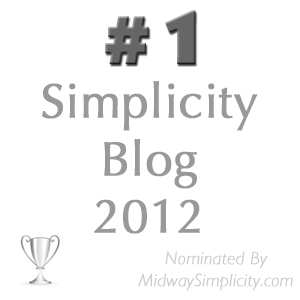 Like you, blogs such as this one have been a real inspiration on my journey of de-cluttering to a simpler way of living. I love your number two point ~ “…identify what makes you angry, sad, disappointed, stressed, or aggravated about an area. Attack that area first and deal with what you have been avoiding.” The first thing that came to mind for me was the kitchen bin (Simple Human). It is a great bin and has served us well but it doesn’t fit into our new kitchen. It keeps getting in the way of opening the freezer. It has to go. My son is waiting for the day I can say he can have it. I had a similar ‘bin moment’ a few years ago Colleen – constantly moving this big critter to be able to access cupboards. Got rid in the end for a small cupboard one and it has been a great success: much easier to empty too. I assume by bin, you mean garbage can? LOL! I had that issue too about five years ago . . . we thought we needed a large garbage can. My husband hated it, it was always in the way (spewing trash none-the-less), and oddly enough it had a lip that caused bags to tear or get stuck. My husband beat it up every time he got aggravated with it (at least once a week). After searching high and low, we finally found a smaller can that fit between our stove and where the counter ended. Not only did we end up utilizing a neglected space in the kitchen, we suddenly had no can in our way and my husband felt no animosity toward its much simpler design. It took me realizing how aggravating we were with it before I could even think to change it. Its the little things that can make the biggest difference! Ah, sharing the same language but somehow not! Yes, a bin is a garbage can. Great post, and great comments as well. I’m not sure that I have anything to add. The extra thought that comes to mind is the whole problem of sentimentality about stuff, and how that can cause a huge build-up of clutter. My advice would be that stuff doesn’t become sentimental about us, so why do we give it such power over us that we keep it for years, move it from place to place, struggle to find room for it, spend money, time and energy on it? I have allowed myself to become sentimental over belongings but I think it now has less of a grip on me. I also think we have to keep questioning ourselves so that we don’t just do things/buy things/keep things because everyone else does, or because that’s how it used to be. It should be about how we want to live now and that should be our own individual choice. Yes some great comments Christine and thanks for your too. Sentimentality is a difficult one for many I find. There’s no simple way to lessen attachment I think, other than to challenge what underlies the sentimentality. With clients, for many of them, once I ask does this item give you joy every time you see it, it’s amazing how many sudden have a ‘light bulb moment and toss in in the bin (or charity bag or recycling), lol. I too have found this process of gradual de-cluttering has enabled me to become less sentimental about things I own. I help myself further now by not bringing items into my home I don’t absolutely love that I know would be hard to let go of because of sentimental attachment or ‘might come in handy’. But I also give myself permission to keep anything that feels too tough to get rid of…there’s still plenty of easier stuff to work through. Hi Christine and Doodle. Great post. The best quote I have read about sentimental items is “don’t cry over something that would not cry over you”. I try to remember this when I am having trouble letting go of an item. I then take a photo and get rid of it. Photo taking can be such a great way to keep a memento but not the bulk of the actual ‘thing’. I had a favourite chair that I kept the photo of for some time…but have been able to let go of that too now. It’s amazing how we can imbue inanimate objects with feelings isn’t it. Our things don’t care about us! Good post Doodle. I like calling this a life skill. I have found that each person has different reasons for why they hang on to things so my recommendations change accordingly. The biggest one it to get rid of those things that don ‘t make you happy when you see them. If you dread having to dust them, move them to get to something else, or struggle to find them then they probably are more work than they are worth. Thanks Deb J. I think it could all come down to that one simple suggestion: if it doesn’t make you happy when you see it, let it go. I think we have to recognise that initial emotion quickly before all the ‘should and oughts’ flood in and give us ‘reasons’ to hang on to it for longer. I don’t tend to do a lot of dusting, lol but I do hate having to move one thing to get to what I want, and when helping a client reorganise what they are keeping, I always teach that one as it’s a sure fire way for things not to be put away properly if you have to do that. Thanks a lot Laura. I always get clients to start with the easy stuff, like you suggest, because that gives quick satisfying results without being too threatening. The good feeling they get from this tends to hook them in just as you suggest. This way of describing decluttering really speaks to me, Doodle – I used to think that the ability to keep the clutter away was something that either you had or you didn’t have. I thought that if you got rid of sentimental things you were a cold-hearted person (!) and I didn’t see myself as cold-hearted, ergo I could not throw things out. If I had been able to see this as a life skill from the beginning, it would have been easier, I think. But that was the viewpoint that I eventually came to, over time, as well. The more you do it, the better you get. And it can be taught, definitely. Colleen has been teaching it from day 1 – and in their own ways, so have many of the commenters here. I agree with Michaela’s point 1 – start somewhere, anywhere. Think about small pieces of the large picture so you don’t get overwhelmed. That’s great to hear Jo H. I too used to think people were cold hearted if they even got rid of Christmas cards. Oh, how times have changed, lol. It’s wonderful to think it is never to late to learn new stuff and that we can keep growing and changing as individuals whatever our age. overwhelm is the biggest cause of paralysing in my experience. So yes, start with anything, however small. But it’s best to start with the easy stuff. *Have you thought about it in the last 2 years? Thanks Meg. 3 really simple but very very powerfully effective points. I’ve lost count of the number of times I’ve said” there isn’t a world shortage of * insert word of choice*…stationary/novels by best selling authors/ring binders etc etc.” And yet we hang on to an excess of these things like they were the last ones on earth. And people do get very trapped emotionally into keeping stuff they don’t need of like because someone else gave it too them. This has made me much more conscious of what I give to other people: I rarely give ‘things’ as gifts anymore. Great post Doodle, very thought provoking. I would suggest saying NO, NO Thanks more often. We learn, from a young age, that the only way to get things is if they are gifted to us. Then, as we leave home, we accept freebies because we have no money to spend. We have children (? )and everyone gives you their old stuff. Our relatives die and we end up with their stuff. An occasional NO would divert some of this clutter. I would then suggest to evaluate gifts and gift giving. If there wasn’t a special occasion ( Christmas , Birthday, Valentines Day, Anniversary, )would you spend money on an item for someone? Do you receive gifts that are useless or end up as clutter? Take a break from giving and receiving. Talk about it , accept that others still cling to the idea that stuff is important. Be prepared for people questioning what you have and what you discard. Clutter is different for different people. You will find like minded people to assist and encourage you. Owning your life, very wise words Doodle. Thanks very much Wendy F. Love the big fat NO! And your post is a subject close to my heart. I mentioned in a previous reply that I buy fewer and fewer ‘things’ for people so I don’t put them in a position I don’t enjoy myself. My husband & I have freed each other from buying presents for each other at Christmas/birthdays or other ‘expected’ days and it is such a relief to both of us. It does leave us free to be spontaneous at other times of the year if we see something though. But saying NO to offers of freebies, from family or shops definitely is another skill that can be learned. Where I live, people leave a lot of 2nd hand furniture on the streets for others to have and this has been my absolute weakness. But in the last 2 years I have trained myself to walk on by – we have all the furniture for our needs. That was my weakness too! Street stuff!! I still look, and if there is anything of interest I will grab it and take it to my friends (junk) shop ASAP. Colleen is an expert at saying no to freebies! I witnessed her flatly refusing items whilst we were out one day. I, on the other hand ……accepted the freebies . Great post Doodle. I am glad you set out with a post that introduced yourself, what brought you to 365 in the first place. Look how far you have come. And you asked just the right questions to inspire some great responses. Well done! So many good responses here, all with the same message in the end – Letting go can be learned. It is a matter of changing your mindset. This can be done by the right trigger, just the right logical-for-you reason to let go of something. Be that an item or a habit. The fact that we tire of items we were so keen on in the first place is proof that mindsets do change. If they can change for wanting, liking and finding stuff useful then they can change to assist us to let go. I SO wish my husband would realise he doesn’t have to keep everything he has ever owned. Doodle, you are right: it is a life skill people need to learn. My first two tips would be the same as Jane’s: do it slowly and stop bringing things in. For my husband I would add this as the third: don’t store unwanted and unused stuff in the garage or under the house, just in case. If it is out of sight, it will go out of mind, and rot, perish and become unusable there: unusable for anyone, so much so that it cannot be sold or donated and only ends up as landfill. Better to give the item earlier to someone else so that it has a new life and is less of a cost to our environment – and a dangerous pile of mess under the house. Can you see I have a bit of an issue? But I won’t throw stones, just yet, living in my own glass house. Lucinda, if it is any encouragement to you, you could have been writing about my husband word for word. And very slowly things are improving and what I learnt about ‘handling’ him and his stuff is responsible for me know doing this professionally. As you will know, patience is a key word! But it is also ok to acknowledges your own needs in your own home. !. It is okay to let go of stuff. Too many times people hold on to items out of obligation, even when they don’t like an item. Giving yourself permission to let an item go is a must. 2. Start with the easy things first. Things that are too sentimental or would cause too much stress in decision making can wait. 3. Keep your end goal in mind, (perhaps having an idea of how you want a room to look), to keep you motivated. Don’t give up no matter how impossible the task my seem. 1. Having less to take care of reduces stress on the mind and body. 2. There is less to have to clean, so you can spend that time doing things that are more meaningful. My desire to acquire items/shop has dwindled greatly too, now that hard earned money (as well as time) can be saved for more meaningful life experiences. The goal is to have a greater quality of life not a greater quantity in life. 3. Everyone in the household is happier. Living in a cluttered home is not enjoyable for anyone who lives there. When people can move around freely without tripping over or knocking over things, they feel better in their surroundings. Thanks Jen. The idea of keeping your end goal in mind is actually an important one I think. When I’m with a client who is struggling, I will gently bring them back to what there end goal is. In fact my opening line is often ‘what do you hope to achieve today. This means they have set up their own goals so I have something to hold them too if appropriate. With my own stuff, my end goal if for everything to have its own easily accessed place. Great post – and good comments and suggestions. I would add this: expect it will be hard sometimes but make it as fun as possible. I know several people who are surprised that decluttering can hit an emotional obstacle and want to bail out. Its human nature to avoid discomfort, but push through. If you can’t deal with that today, go around it and deal with something else. If you want to deal with it today, call for backup – how often I have gotten myself in a tizz over something only to be told by one of my daughters that they never really liked it anyway. Nothing like hearing something like that to deflate righteous attachments. And definately make it as fun as possible. Play some music really loud, offer yourself a reward for finishing the job, whatever it takes, take before and after photos, weigh things as they leave the house and keep a tally, keep a register to hit a goal number. Moni, I am always amazed at how little attachment my children have to things. On more than one occasion they have given their opinion and helped me let go of things. I have way more attachment to some things than they have. That is a good thing as I think they may not have to deal with clutter issues as they get older. I like to give the advice of setting boundaries on stuff – just this box of high school memories or whatever. It’s helped me! Other advice would be asking if someone regularly uses it – justin case isn’t enough of a reason! Ooh well done on the stair challenge!! This is another example of the principle that small everyday actions make a difference over time. I also like the boundary thing: I did this with my craft stuff: it now all have to fit into one cupboard or it goes. 1) Do it slowly. Let your mind adjust to what you are doing. 2) Don’t give up. The attachment we form to objects is very bad for us. We personalize things and we attach ourselves to them and then we can’t let them go. 3)Discover your REAL self. Not the imagined one. Not the one you want people to think you are, but the real you. Lots of clutter will go away together with the “imaginary” person . Spot on Andreia re the imagined self. And I think working on your real self has such knock on benefits for the rest of your life. I love using the real vs imagined self with clients. You often see the relief in their faces when they realise they don’t have to keep those 200 empty jars anymore because they are never ever going to make that jam! And that it is ok not to be that jam making woman they always thought they should be. I hadn’t thought of it as a skill, but I guess that is a good way to think of it, since a person really gets better at it the more they declutter. And I was aware that people do help others declutter as a profession. I can’t think of much to add. It has helped me to be aware of where my stage of life is–children grown, younger grandchildren nearing middle school age, some in college-so a lot of items that were once in use and therefore of value are no longer needed. We seldom “babysit” and I seldom do any mending for anyone. We still have some overnight company, but no longer do the big family gettogethers. We don’t really decorate for any holiday any more unless someone will be visiting. on the actual day. All of this has helped me realize a lot of items had “overstayed their welcome”. As far as sentimental items go, we think of our relatives without needing even a photo, since many things will remind a person of some incident, so only something you really like should be kept in that area and not because you might feel guilty getting rid of it. This was a real good article, Doodle, and everyone’s comments were thoughtful and looked at another side of decluttering. So let’s all work on our skill. Hi nana, I think it does help to look at it as as a skill: just as knowing how to run a home is one. I think it places a value on ourselves and is definitely transferable to other areas of our life. Your comment about not even needing a photo to remember a loved one reminds me how power a smell memory can be. One smell of a certain type of polish and I am right back with my grandparents. I am also curious as to how you got started doing this professionally as it something i have considered recently when looking at the skills I possess. Hi Debra F . I headhunted myself to a company I actually used myself 4 years ago. I wrote long letter saying why I felt I would be an asset to their company and what I felt I had to offer. I’ve never sold myself like that before but for the first time I truly felt I had found my life found my calling. Soon after I finally realized that I could do this, I brought in something. Granted it was cool. It is already on display. But should I have bought it? Everyone had such great comments and advice! Ah Gina, the important thing is, you are now thinking about what you buy and why. Rome wasn’t built in aday and it takes time to change habits. If your new item gives you pleasure, then great. How about ensuring things leave the house to balance it out? 1 in 5 out sounds an excellent trade off. Thank you for this article and the inspiring comments so far. Decluttering advice really depends on the stage you are in. 1) If you see something that you really want to declutter, don’t put it off. Just do it and get it out of the house as fast as possible. 2) Before buying something new look aroud if you already have something that can do the job as well. 3) Relax – decluttering is no contest. How fast you declutter is your own choice. 1) Less time needed to get the house company ready. 3) I love being a better role model for my children. How serendipitous, I’m writing a series of posts on my blog about how to start and keep going at decluttering! 2. Walk round your house and note the areas that really upset you. Which upset you most? Start there. Getting the one spot you really can’t stand sorted will give you the high and oomph you need to keep going. 3. DO NOT start with the garage/attic/cellar/outbuildings. (a) they are probably the hardest places to do and more importantly (b) if you clear them out you will be tempted to move stuff from the house to them. If they are full already you can’t be tempted! Hi Gillie:Top tip not to start in attic/ garage etc! It is guaranteed to be overwhelming and as you say, a great dumping ground for differed decisions. I work on our attic a bit at a time. what an amazing post and amazing answers. 1) SET A GOAL – mine was to declutter my home so that I could in principle live there with only one arm to use… no more holding the things with one hand while pulling out another item from the back with the other – so annoying!!! 4) INSIGHT –> I got a good idea of who I was and what I wanted. I like myself better because I learned to accept me and my lack of talent for those oh-so-cool projects. of course there is always a personal limit to insight and understanding. there are minimalists who dont need anything, there are hoarders who struggle with massive issues. I know my limits and respect other peoples limits. Love it Lena. I think the declutter journey can raise such fundamental issues of self awareness. It’s like the domino effect or ripples from a thrown pebble in a lake. I think be gentle with yourself is also an excellent way to be: if it is too painful to get rid of it,then don’t. I’ve surprised several clients with that: it’s ok to walk away from decisions that are too tough. There’s plenty of easier stuff to tackle in my experience. My own experience is you revisit those tough decisions when you are ready. I lol at the one armed principle: too right! 2 go slow, so you can get used to the empty spot! What a tremendous post! I have loved reading all of the responses as well. 1) Make realistic goals. Today I wanted to do a bunch of decluttering but I only made it through our DVDs, CDs and my hutch. But then I realized how much I did get done. Instead of starting out with a vague “bunch of decluttering” it would have been better to have had a list ready with different areas I hope to tackle over time. When I was threatened with feelings of not doing enough the mantra of 365 Less thing, a bit at a time, came to my rescue. 3)Know when to stop. I was so thrilled about getting some areas cleaned out that it would have been easy to start another project but sometimes it is better to just quit and start fresh another day. 4)Helping others who may need what we aren’t using. Hi Grace, some great thoughts here – I think being able to tackle small amounts of clutter at a time and know when to stop would help so many more people deal with their excess stuff, I really do. I find when I have a bigger purge, things always look worse before they get better. It is so much better not to run out of steam and be left in more chaos, as this reinforces ‘I can’t do it, it’s too big a job’. I think 365 helped me get a great satisfaction from little bits at a time. A much better idea is to make one scrapbook per child — buy a simple, ready-made scrapbook; don’t fill your house with scrapbook supplies! — and take pictures of sentimental items, then donate them. A good way to do this? At the end of each school year, sit down with each child and go through their toys — “Do you still play with this? No? Do you feel sentimental about it? No? Okay, then, wouldn’t you rather donate it to a child in need?” Have the child try on everything in the closet, and donate what no longer fits, or pass it down to a younger child. Exceptions: you may want to put away Grandma’s lovely hand-knit sweater, or a very few other special items. If the child feels sentimental about a no-longer used toy or book, set it aside, and visit it again at the end of the following school year. If YOU feel sentimental about an item your child no longer wants, do not save the item — take a picture of it and put it in the scrapbook. Put selective items in your scrapbook, like award ribbons or special childhood drawings. NOT every single coloring book your child filled in! DISCARD ALL HOMEWORK. If your child does wish to take a walk down memory lane when she if forty, she almost certainly will NOT want to look at her fifth-grade maths homework. Sorry, young lady, but a gigantic collection of gadgets does not make you a good cook. You simply do not need all those specialty gadgets: banana slicers! Hundreds of specially shaped and holiday themed cookie cutters and cake molds! No, a good cook needs little more than a set of good pots and pans, a set of good mixing bowls and storage containers, a good set of knives and a good set of cooking utensils, a blender, a toaster, a coffeemaker, a couple of cutting boards, a mixer with dough hook IF you bake a lot, a set of baking pans, and a modest-sized food processor. Not much else. Most of these gadgets did not exist at all when out great-grannies were cooking — and they tended to be very good cooks. THIRD: HOLIDAY THINGS! You do not “need” to come up with a different theme for each Christmas tree. Far better is to keep good quality and/or sentimental decorations: the glass reindeer that belonged to Grandma, which both you and the kids delight in seeing each year (rather than a tree full of new, carefully matched, baubles each year) Go through your holiday collection MERCILESSLY. Few things take up more space in a home than box upon box of decorations for every conceivable holiday. We have one plastic tub of tree decorations, a smaller tub for lights (tree and outdoor), and a smaller box for greeting cards and ribbon. We do not have multiple rolls of gift-wrap paper, either. I buy a large roll of white, glossy paper as needed and match the ribbon color to the holiday. It takes up so much less space in the home. Lastly, as a general tip, don’t get rid of things you truly love, but DO find a better way to organize and/or display them. If you are a book lover, books belong on bookshelves, not tabletops, windowsills and every available space. Many thanks Dez for your contribution: all excellent pieces of advice.